If there was one style of beer (well, one other than a lager) that’s not going to have Aussie beer geeks dropping everything to seek out a new release, mild ale would probably be up there. Low in alcohol and malt dominant, they’re just so old fashioned and, well, English when compared with the golden explosion of a thousand Aussie hop bombs. Which is a bit of a shame really because a well made mild truly is a beautiful piece of craft, its lightweight nature belying its depth of flavour. It’s with that premise in mind that Grifter Brewing came up with its Super Mild, the brewers imposing a challenge onto themselves to divert from the stronger stuff currently occupying their brewery taps to offer something you could enjoy a couple of midis of without troubling the breathalyser. 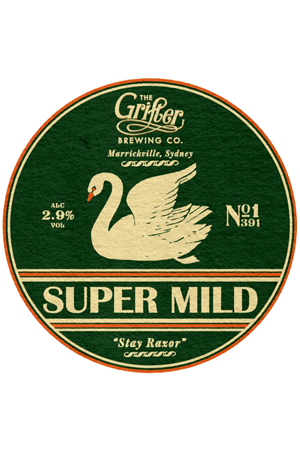 Super Mild has been made with four varieties of malt – Vienna, Munich, Chocolate and Crystal – to give it a bit of sweetness and an amber or light mahogany colour. Using late and dry hop additions of Vic Secret hops, it’s got a low count on the bitterness front and an earthy character designed to counter the sweetness. It’s not meant to be the kind of beer you go back to after having a few other punchier styles, so the best option may be to just start on it and stay on and on.